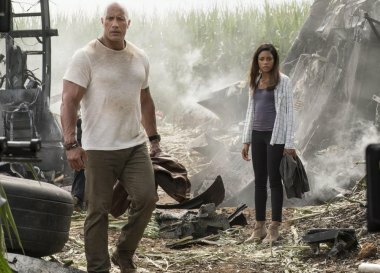 Global megastar Dwayne Johnson headlines the action adventure “Rampage,” directed by Brad Peyton. Primatologist Davis Okoye (Johnson), a man who keeps people at a distance, shares an unshakable bond with George, the extraordinarily intelligent, silverback gorilla who has been in his care since birth. But a rogue genetic experiment gone awry mutates this gentle ape into a raging creature of enormous size. To make matters worse, it’s soon discovered there are other similarly altered animals. As these newly created alpha predators tear across North America, destroying everything in their path, Okoye teams with a discredited genetic engineer to secure an antidote, fighting his way through an ever-changing battlefield, not only to halt a global catastrophe but to save the fearsome creature that was once his friend. Serving as executive producers are Marcus Viscidi, Dwayne Johnson, Dany Garcia, Jeff Fierson, Toby Emmerich, Richard Brener and Michael Disco. The creative team includes director of photography Jaron Presant (2nd unit, “Star Wars: The Last Jedi”); production designer Barry Chusid (“San Andreas”); editors Jim May (“Goosebumps”) and Bob Ducsay; and costume designer Melissa Bruning (“Dawn of the Planet of the Apes”). Music is composed by Andrew Lockington, who created the scores for “San Andreas” and “Journey 2: The Mysterious Island.” The “Rampage” creatures are brought to life by acclaimed VFX supervisor Colin Strause (“San Andreas,” “X-Men: Apocalypse”), with five-time Academy Award-winning visual effects company Weta Digital (“The Lord of the Rings” Trilogy, “Dawn of the Planet of the Apes”).